The health and vitality of a community can be determined by the organizations that flourish within it. If there are schools and libraries to educate, churches to provided religious and social interaction, and small businesses to provide for the community, then the neighborhood is on good footing. By the end of the nineteen-teens, the Polonia of Niagara Falls had all these things and now needed another important institution, a locally-owned bank. With Holy Trinity as its epicenter, Polish business spread along East Falls Street to Porter and with the help of Alexander Zaleski, residential homes beyond. As the area prospered Zaleski saw that the Poles needed financial services that downtown banks were reluctant to provide. So with the help of Buffalo industrialist Maxwell M. Nowak, Zaleski gathered a number of the areas prominent Poles and organized the Falls National Bank on October 24, 1919. The founding board members consisted of Maxwell M. Nowak as Chairman, Alexander Zaleski as President, Dr. Leo J. Rozan as Vice President, W. B. Allman as Cashier and L.W. Kaminski as Manger of the Foreign Department. The rest of the board was made up of Frank W. Grzeczkowski, Thomas Wisz, Henry A. Thrun, Stanley J. Palowski, Julian Winiarski, and John Zaidel. With their money as the base the bank was chartered and opened to the public November 15, 1919. With a bank of their own, the Poles of Niagara Falls came in droves to open accounts at Falls National. In the first month and a half deposits reached $84,688.55 with another $254,000 coming in by the end of the first quarter of 1920. From their offices at East Falls and Fourteenth Street the bank offered a variety of services, from conventional loans, to corporate and personal checking and even offered a “house account in your wife’s name.” With this variety of financial products and the booming businesses of Niagara Falls’s Polonia, the bank reached a million dollars worth of assets by the end of 1920. As both the Polish and Italian communities grew in east Niagara Falls, the Falls National Bank found it necessary to build a home that could better meet their needs. 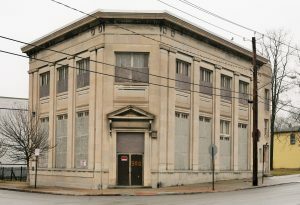 On January 31, 1924 bank President Zaleski announced that the firm had purchased the northwest corner East Falls Street and Portage road and planned to erect a $100,000 building. The plans prepared by the Morgan, French and Company Inc. of New York called for a cast granite structure faced with Indiana limestone on a reinforced concrete base. Torrazzo with a marble mosaic border would be used on the main banking floor while the offices and private rooms would be finished in mahogany. On the second floor, a director’s room would overlook the main floor while office space would be created and rented to outside businesses. 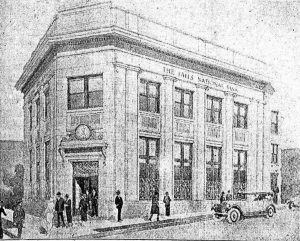 On April 1, 1925, the completed Falls National Bank was opened with much pomp and circumstance. The bank also welcomed its first two tenets to the second floor offices, Dr. John T. Nicholaus and Dr. Leo J. Rozan. As the 1920s roared on, the bank continued to thrive and by the end of 1928 deposits hovered around two million dollars. The bank projected growth for the next year and into the 1930s but the stock market crash of 1929 changed their outlook. Under the leadership of the board and with Zaleski as president, Falls National began to adapt to the growing Depression, but a second tragedy would befall the bank in the summer of 1930. On June 28, while sitting on the front porch of his home Alexander Zaleski suffered a heart attack. He was rushed to Mount St. Mary’s and was admitted to the hospital but shortly thereafter breathed his last. By the end of the week he was buried and Dr. Leo J. Rozan was named the new president of the Falls National Bank. As the national financial crisis worsened, the bank began to stumble. Doctor Rozan hoped that 1932 would be the year that the ship would right, but the economy still declined. On March 6, 1933 every bank in the United States, including the Falls National Bank suspended operations by order of President Roosevelt. While many other banks reopened following the mandatory banking holiday, Falls National did not. That summer bank examiners recommended that the bank be liquidated, but the majority Polish stockholders struck the idea down. Instead they attempted to reorganize the bank and began to look for a cash infusion. With the share holders refusing to give up, but unable to raise the $100,000 needed the bank fell into receivership in October 1933. The bank continued to operate in some capacity over the next five years until it ultimately failed on August 1, 1938. Despite the failure, the Falls National Bank still had some very valuable assists, a beautiful and functional bank building and fiercely loyal customers. Seeing this, the Manufacturers and Traders Trust Company purchased what was left of the bank in 1939. M&T reopened the corner bank as a branch on June 1 and asked Dr. Rozan to serve in its advisory board, which he did well into the 1970s. Today the branch sits empty, ready to be redeveloped. "A Peep Into the Past." Niagara Falls Gazette [Niagara Falls, NY] 31 Jan. 1939: 4. Print. "A Peep Into The Past." Niagara Falls Gazette [Niagara Falls, NY] 14 Jan. 1956: 12. Print. "Alexander Zaleski, Bank Head, Realtor, Dies Suddenly Here." Niagara Falls Gazette [Niagara Falls, NY] 30 June 1930: 1. Print. "Anton Keller Is Called by Death." Niagara Falls Gazette [Niagara Falls, NY] 26 Apr. 1939: 1. Print. "Bank Depositors Decline Proposal for Liquidation." Niagara Falls Gazette [Niagara Falls, NY] 9 Aug. 1933: 16. Print. “Bank Will Open Here on June 1." Niagara Falls Gazette [Niagara Falls, NY] 27 Apr. 1939: 1. Print. "Banking Backbone of City." Niagara Falls Gazette [Niagara Falls, NY] 8 Oct. 1967: F-12. Print. "Banking Interests Optimistic Respecting Future." Niagara Falls Gazette [Niagara Falls, NY] 2 Jan. 1925: 27. Print. "Card of Thanks - ZALESKI." Niagara Falls Gazette [Niagara Falls, NY] July 1930: 21. Print. "City's Banking Heads Feel That Cooperative Forces of World Will Aid Business Revival." Niagara Falls Gazette [Niagara Falls, NY] 2 Jan. 1932: 29. Print. "Dr. Rozan Named Bank President." Niagara Falls Gazette [Niagara Falls, NY] 14 Jan. 1931: 1. Print. "Explains Claims." Niagara Falls Gazette [Niagara Falls, NY] 23 Jan. 1937: 1. Print. Falls National Bank. Buffalo Evening News [Buffalo, NY] 17 Sept. 1920: 23. Print. Falls National Bank. Niagara Falls Gazette [Niagara Falls] 26 November 1920: 17. Print. Falls National Bank. Niagara Falls Gazette [Niagara Falls, NY] 9 Feb. 1921: 13. Print. Falls National Bank. Niagara Falls Gazette [Niagara Falls] 13 September 1921: 10. Print. The Falls National Bank. 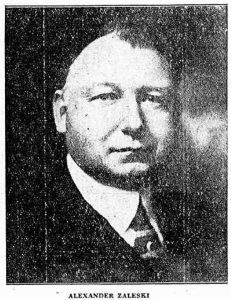 Niagara Falls Gazette [Niagara Falls] 2 January 1923: 28. Print. "Falls National Bank Depositors Receive Plan for Reorganization." Niagara Falls Gazette [Niagara Falls, NY] 7 Aug. 1933: 24. Print. "Falls National Bank To Build New Home At Falls And Portage." Niagara Falls Gazette [Niagara Falls, NY] 31 Jan. 1924: 16. Print. "Falls National to Pay $86,000." Niagara Falls Gazette [Niagara Falls, NY] 22 Jan. 1937: 1. Print. “Few Changes In Bank Elections." Niagara Falls Gazette [Niagara Falls, NY] 12 Jan. 1921: 14. Print. "First Empire State Corporation - Company Profile, Information, Business Description, History, Background Information on First Empire State Corporation." First Empire State Corporation - Company Profile, Information, Business Description, History, Background Information on First Empire State Corporation. Reference for Business, n.d. Web. 14 Dec. 2016. "FRANK MAJCHRZAK." Niagara Falls Gazette [Niagara Falls, NY] 15 Dec. 1971: 51. Print. “Gets Bank Post." Niagara Falls Gazette [Niagara Falls, NY] 3 May 1939: 24. Print. Jabaily, Robert. "Bank Holiday of 1933." A Detailed Essay on an Important Event in the History of the Federal Reserve. Federal Reserve History, n.d. Web. 18 Dec. 2016. "Laud Alexander Zaleski." Niagara Falls Gazette [Niagara Falls, NY] 3 July 1930: 18. Print. Manufacturers and Traders Trust Company Vs. Elliott V. Bell, as Superintendent of Banks of the State of New York. 1. Court of Appeals of the State of New York. 30 Dec. 1946. Print. "Martin Receiver for Falls Bank." Niagara Falls Gazette [Niagara Falls, NY] 28 Oct. 1933: 18. Print. "Medical Society Will Honor Dr. Rozan." Niagara Falls Gazette [Niagara Falls, NY] 10 Dec. 1962: 21. Print. Mizer, Hamilton B. "Niagara Topics." Niagara Falls Gazette [Niagara Falls, NY] 12 Sept. 1956: n. pag. Print. “MRS MAJCHRZAK DIES." Niagara Falls Gazette [Niagara Falls, NY] 15 Feb. 1937: 11. Print. Murphy, Bill. "Falls Doctor Broke In Hard Way in 1913." Niagara Falls Gazette [Niagara Falls, NY] 12 Dec. 1962: 31. Print. "Niagara's Banks Basis Of Sound Business Growth." Niagara Falls Gazette [Niagara Falls, NY] 17 May 1954: 12-A. Print. "New Bank Will Be Opened Here." Niagara Falls Gazette [Niagara Falls, NY] 18 Feb. 1939: 1. Print. "New Building to Be Erected by Falls National Bank to Be Commercial and Ornamental Asset, East Falls and Portage." Niagara Falls Gazette [Niagara Falls, NY] 11 June 1924: 2. Print. "New Home of the Falls National Bank." Niagara Falls Gazette [Niagara Falls, NY] 2 Jan. 1925: 27. Print. "Possibility of Reorganization of Falls National Bank Taken Up." Niagara Falls Gazette [Niagara Falls, NY] 11 July 1933: 1. Print. "Prosperous Year For City Predicted By Falls Bankers." Niagara Falls Gazette [Niagara Falls, NY] 2 Jan. 1929: 23. Print. Report Of Condition Of The Falls National Bank. Niagara Falls Gazette [Niagara Falls] 12 January 1920: 13. Print. Report Of Condition Of The Falls National Bank. Niagara Falls Gazette [Niagara Falls] 12 May 1920: 15. Print. Report Of Condition Of The Falls National Bank. Niagara Falls Gazette [Niagara Falls] 2 April 1929: 22. Print. Report Of Condition Of The Falls National Bank. Niagara Falls Gazette [Niagara Falls] 6 January 1932: 16. Print. "Reserves Decision on Bank's Plea to Form New Branch." Niagara Falls Gazette [Niagara Falls, NY] 24 Aug. 1945: 21. Print. "Should Open Falls Street Through Railroad Property, Establish East Side Park and Install New Lights." Niagara Falls Gazette [Niagara Falls, NY] 2 July 1921: 2. Print. "Statement of Condition, June 30, 1965, Manufacturers and Traders Trust Company." Niagara Falls Gazette [Niagara Falls, NY] 2 July 1965: 5. Print. Williams, Edward T. Niagara County, New York, One Hundred of the Most Wonderful Regions in the World: A Concise Record of Her Progress and People, 1821-1921, Published during Its Centennial Year. Chicago: J.H. Beers, 1921. Print. Witul, Gregory L. "Buffalonian Memorialized in Krakow." Am-Pol Eagle [Cheektowaga, NY] 6 Sept. 2012: 9. Print. Zaleski, Alexander. "Conditions on the East Side." Niagara Falls Gazette [Niagara Falls, NY] 2 Jan. 1925: 27. Print.